I am trying to remove the RF control link on my 03 Accord. I am unable to insert a standard 5mm "L" metric allen wrench into the lower bolt due to the limited clearance from the bottom control link bolt to the wishbone strut. Is there a special "stubby" allan wrench or do I need to remove the bottom strut bolt so I can push the strut back for room? My factory DVD shop manual simply says to use the allan wrench to keep the bolt from turning, but I cannot figure out how how to insert with so little clearance from the strut. The top link bolt is easy with lots of room. I have the one side jacked up and wheel removed. Any help will be appreciated. See if these instructions with pictures might help you. You secure the stud with a 5mm hex key, then loosen the nut with a 14mm wrench. You might try raising the car a little more. Thank you for your reply-unfortunately your pictures show a earlier model- the 03 uses a wishbone strut support, and it is the clearance between the bottom stabilizer link bolt and the inner wishbone member that prevents inserting short end of the allan wrench into the bottom bolt end. 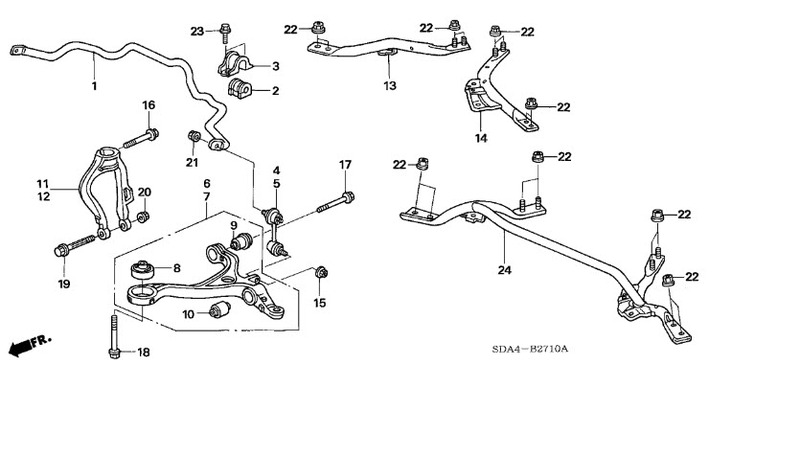 The 2003 Honda front lower arm diagram is attached. The Neuspeed instructions sure looks like the same as the 2003 model to me. 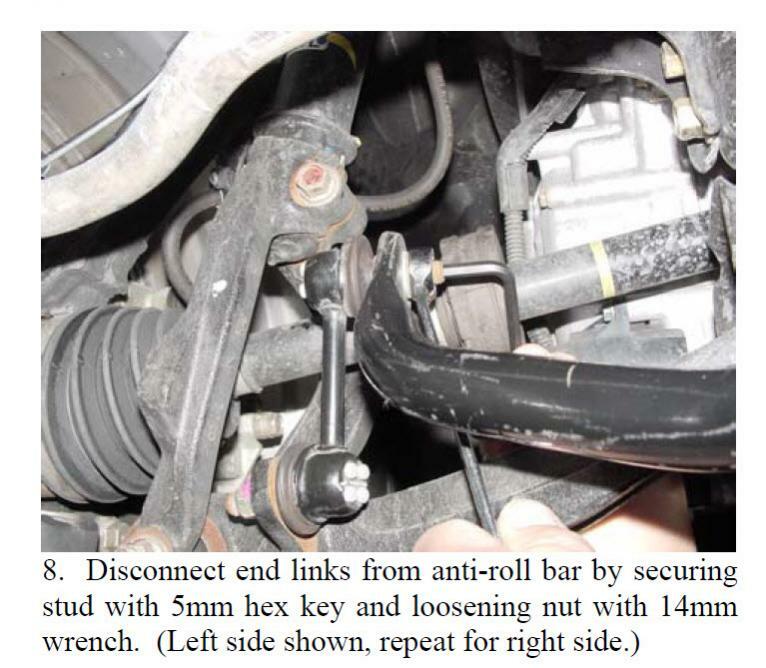 Also, Honda didn't have that type of stabilizer link in Accords earlier than 2003 models. My 2009 has a similar type stabilizer link. Thank you again. I wound up removing strut fork bottom bolt and was able to move the fork so I could get an allen wrench into the link bolt end. Anyway, the allan key bolt end cracked while trying to loosen the nut after a 1/2 can PB Rust soaking overnight.. I had to cut the bolt. I thought of torching to heat the nut but I was concerned about too many rubber stops/shims nearby. I should probably do the other side but not today..
A lot of people that used Kano Kroil penetrating oil says it's one of the best out there and better than PB Blaster. You can research Kroil and find people that says it loosen things easier. If you do a search under "Kroil google deal", you can get two king size cans for $12, directly from them. That's far cheaper than any other offer.